It is not an exaggeration to say that if, today, I had to choose one vehicle to drive for the rest of my natural life, it would be this 2017 Chrysler Pacifica Limited. I wouldn’t be thrilled about it—I’ve got the fob of a Porsche this week—but there it is. #minivantruth. Why? Because minivans rock, a priori. Easy midrow entry, two rows of flippy-foldy seats, flexible cargo space that can handle 4X8 plywood, and the blessed, Promethean gift of sliding side doors. Many minivans have dual-screen entertainment systems with headphones, which act on restless children just as the lightest touch of a rubber mallet. What’s not to love? The Pacifica minivan, a crown-jewel segment for Fiat Chrysler Automobiles, is coming off a $2 billion redesign that should keep it technically relevant for some time. It only has to outlast me. You might ask if minivans are so great, why are they losing market share to crossovers and SUVs? Segment sales have fallen from about 1.4 million units in 2000 to about 500,000 last year. Ford and Chevy don’t offer minivans for the U.S. anymore. The remaining players include the Toyota Sienna, Honda Odyssey, Nissan Quest and Kia Sedona. There’s a hint. The whole category has been historically under-baked; and no product has been more gooey in the middle than Chrysler’s bailout-era Town & Country and Dodge Grand Caravan. I would have changed the name, too. The institutional bet on the part of FCA is that a comely, well-proportioned minivan, properly executed, can claw back market share from SUVs and crossovers. In order to do that, the reasoning went, Pacifica had to challenge the stigma of minivans as scarlet letters of domesticity. I’ve always been uneasy about the predicate here. Minivan shaming, lightly laughed off, reflects the larger culture in which we regard family and commitment as lingering, fatal conditions to be first avoided. God, people are shallow and insecure. I’m glad I’m not one of them. In any event, FCA spent a lot to make the Pacifica look great, in hopes that pride of ownership would help ease the shame of functioning ovaries, or whatever. The Pacifica casts about the same size shadow as the retiring model, just a tick wider, with a deeper stance over wheel wells that fit 17-, 18- or 20-inch wheels. Its signature flourish is the gently bowed roof, a flyline with the bright metallic roof rails. 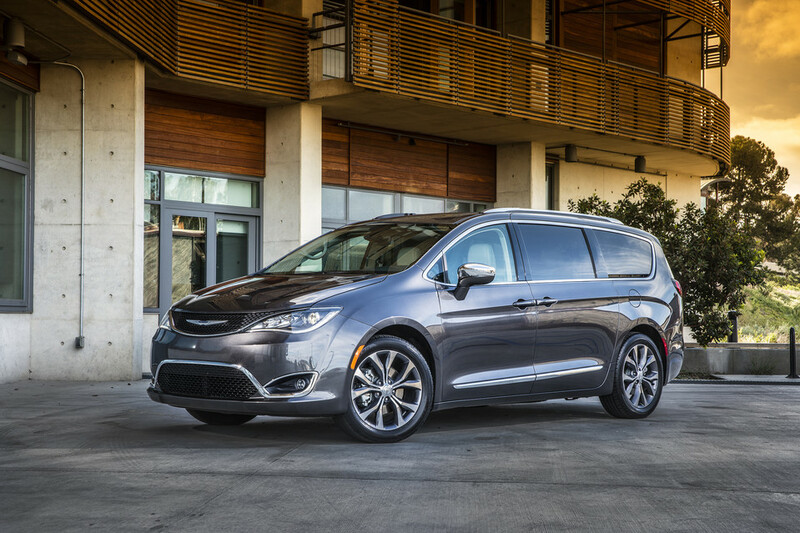 The Pacifica wants very much to be seen, with gussying bright work framing the windows, the upper and lower grille, and the lower light line. Please observe the way the two character lines—rising from scroll-like curves, fore and aft—come together under the A pillar, dashing together like fencing foils. It’s got energy. Dignity. I like it. Mom will not have to put a bag over her head leaving the grocery store. The other big deliverable for the Pacifica team: structure. Minivans bodies want to flex and twist just like a shoebox with five big holes cut into it, six if you count a sunroof. Even a little wiggle has all kind of consequences, from ride and drivability to weather sealing. This inherent character of minivan bodies can, of course, be quelled by the diligent application of money, and that is what FCA has done here, finally. The upper body and lower frame are now bonded together as a proper modern unibody, much of it comprising high-strength steel, with aluminum and magnesium used in the body panels. The resulting structure displays a whopping 90% higher torsional rigidity (resistance to twisting) than the tin can it replaces, while overall weight is down about 250 pounds, to 4,330 pounds. 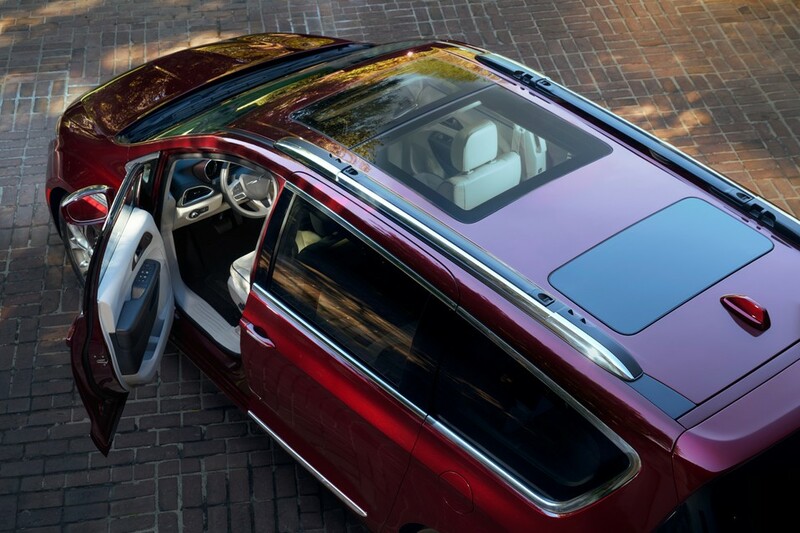 The Pacifica can even be had with a nearly all-glass roof, the optional Tri-Pane Panoramic Sunroof. Imagine sitting in an overturned glass-bottom boat. Not to over-praise. Really, this is how FCA should have been building them all along: Full-perimeter front and rear suspension cradles of high-strength steel; forged aluminum chassis bits like knuckles and control arms; sophisticated suspension geometry; and lots of NVH countermeasures, including acoustic laminate windshield glass; sound-absorbing wheel well liners; and lots of hydraulic bushings, isolators and baffles. This bill of materials really makes a difference, as does a million hours of aero simulation to chase down acoustic hotspots. The Pacifica’s cabin tranquility makes the former seem like an open railcar. Chrysler reports noise levels at cruising speed at are a best-in-class 63 decibels, under the muffling blanket of an active noise cancellation. This provides a proper backdrop for the optional UConnect Theater and Sound group ($2,795), combining 20 Harman Kardon speakers with a 760-watt amplifier and two seatback LCD screens the size of LP jackets. Oh, you want conveniences? Our Pacifica Limited tester ($48,455) had a built-in vacuum cleaner with a 11.4-foot retractable hose; hands’ free sliding doors and liftgate. (you wave your foot under the car to activate); and the latest in Stow’n Go mechatronics. The front seats can be drawn forward. The midrow seats slide and tilt forward to ease access to the back row, even if there is a child safety seat in place. 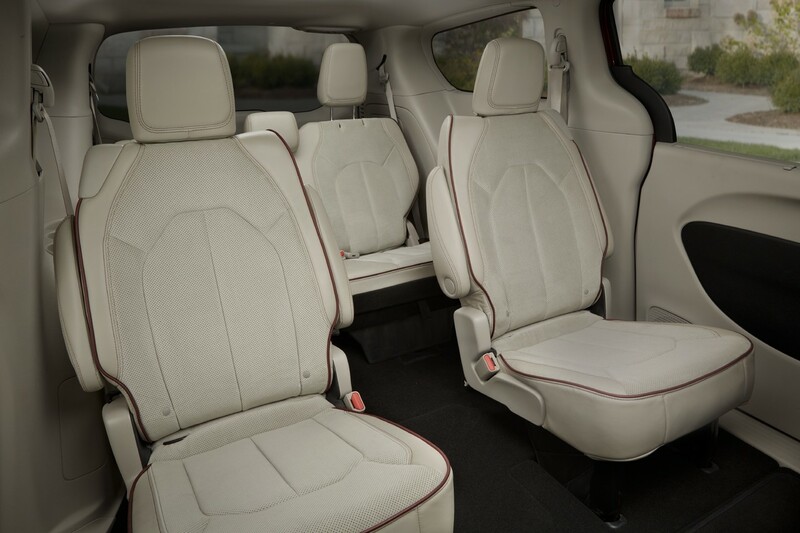 The third-row seats also fold flat and disappear under the cargo bed at the touch of a button. With both seat-rows flat, the interior looks huge, a carpeted hangar. FCA says the interior volume leads the class at 197.3 cubic feet. It’s all so… beautiful. How’s it drive? Adequately, withal. At the moment the Pacifica is available with front-wheel drive, powered by naturally aspirated 3.6-liter V6 (287 hp/262 lb-ft) and a nine-speed transmission. The gear selector is a rotary dial on the dash. This engine-transmission package is strong and capable, but amid all the quietude the big V-6 could get buzzy and displayed moments of transient naughtiness. The transmission’s clutch-on-clutch architecture is abrupt and can make the vehicle lurch a bit at light throttle. If I could push off the car-for-life choice for another 30-60 days, I might opt for the plug-in hybrid. It will use a hybrid-tuned variant of the V-6 combined with a dual-motor EVT and a 16 kWh lithium battery. Projected nominal are 260 horsepower, total system output, 30 miles of all-electric range; and fuel economy equivalent to of 80 mpg, according to the EPA. I say, might. The battery pack will have to go into the floor tubs where the brilliant middle seats usually can hide flat. Stow’n Go seating or saving the planet? Its straightforward touch-screen design, combined with a few traditional knobs and buttons, helps make Chrysler’s Uconnect 8.4 infotainment system a favorite with consumers. Satisfaction with Bluetooth and voice commands—often sore spots with drivers—ranked highly. Don’t confuse the 8.4 with Chrysler’s lesser Uconnect systems, which have smaller screens, less capability, and a much lower satisfaction rating of 49 percent. With an infotainment system this good, it’s too bad very few Chrysler models are recommended by Consumer Reports. Hyundai specializes in making intuitive systems. A 2015 Hyundai Sonata owner says he’s “amazed at how easy it works.” Other owners appreciated that the Genesis incorporates both a touch screen and controller knob. Hyundai’s quick-to-learn voice command and Bluetooth systems rank highest for owner satisfaction. These high-ranked systems from Chevrolet, Buick, and GMC closely mirror Chrysler’s design. Screens are intuitive, most fonts are large, and there are multiple traditional knobs and buttons. Steering-wheel remote controls are comprehensive. Owners generally like using the OnStar system, which can call a live GM concierge for roadside assistance or to download directions straight to the navigation system. MMI uses a controller knob, buttons, and a screen. The system is complex, but many agreed with the 2013 Q5 owner who said it “takes getting used to. Once mastered is intuitive.” The latest Audis feature the optional Virtual Cockpit—which replaces normal instrument gauges with a big digital screen that can display Google Maps and phone calls straight ahead of the driver. This system uses a trackpad or mouselike joystick, and a high-mounted display screen. A Lexus RX owner reports that “using the mouse-based system is cumbersome but manageable.” Owners like that the touchpad is easier to reach than a faraway touch screen. Lexus also won praise for easy-to-use Bluetooth audio streaming. Pairing a bright screen with knobs and buttons, Nissan’s info­tainment systems are intuitive to use, with Bluetooth audio streaming that works well. Most Infiniti models are relatively long into their market cycle, which explains the dated-looking graphics of their info­tainment systems. But Connection, which combines a touch screen with a controller knob, works better than the newer, slow, and glitch-laden Infiniti InTouch system that rolled out first with the 2014 Q50 sedan. A worrisome note: The InTouch system, when separated from the overall Infiniti brand, finished dead last in our rankings—with only 38 percent very satisfied—because of its frequent software crashes and slow startup. Most current Volvo models use familiar-looking radio knobs and buttons to control a center screen. Winding your way through the menus isn’t intuitive or easy. The new generation of Volvo infotainment, launched with the 2016 XC90 SUV, uses a large iPad-like touch screen that requires a lot of fingertip swiping to navigate. Comand pairs a center knob controller with a display screen. Earlier iterations were relatively easy to use, especially for a German luxury brand known for having complicated engineering. But though many rivals are simplifying, the latest versions of Comand have grown more complex, losing familiar knobs and buttons, and gaining a protuberant touchpad and more involved menus. For years, Subaru’s infotainment systems were antiquated. Recent models finally have a modern touch-screen system combined with knobs and buttons. Although clearly improved, the new system remains decidedly average. Voice commands and Bluetooth satisfaction are average as well. Owners complained that the glossy screen “reflects bright sunlight, making it hard to see.” Many owners complained that the navigation system cannot be programmed when the car is moving. Ford was an early innovator in infotainment. But owners of MyFord Touch report reliability problems, with the system “constantly rebooting” and sometimes requiring replacement. Subsequent years have had fewer problems, but the screen design remains cluttered and unintuitive. Certain models replaced buttons and knobs with touch-sensitive flush buttons that were “overly touchy.” A 2013 Fusion owner writes, “MyFord Touch is a wonderful idea that was mostly implemented but was never really finished.” Ford is rolling out the new Sync 3 system, which responds quicker and is easier to use. Honda and Acura info­tainment systems come in several designs, none of which make owners happy. Many were dissatisfied with voice-command quality­—the lowest-ranked among all brands. One owner found it “very difficult to use the commands because they must be said in ‘Acura-speak,’ not commonly used English words.” Our tests found the onscreen buttons and menus to be unintuitive. Toyota’s system combines a touch screen and regular knobs and buttons, but the “whole thing is hit and miss,” one owner says. Complaints include small screens and slow system response. Voice commands often proved to be frustrating to use. The Entune app capability seems “clunky compared to phone apps.” Many respondents voiced frustration that the navigation system cannot be programmed while the car is in motion, preventing even passengers from entering a destination.